This table is beautiful. It looks exactly as it does in the picture. We have had the set for over a year now and it still looks great. The bench is perfect for children and the other chairs are super comfortable. 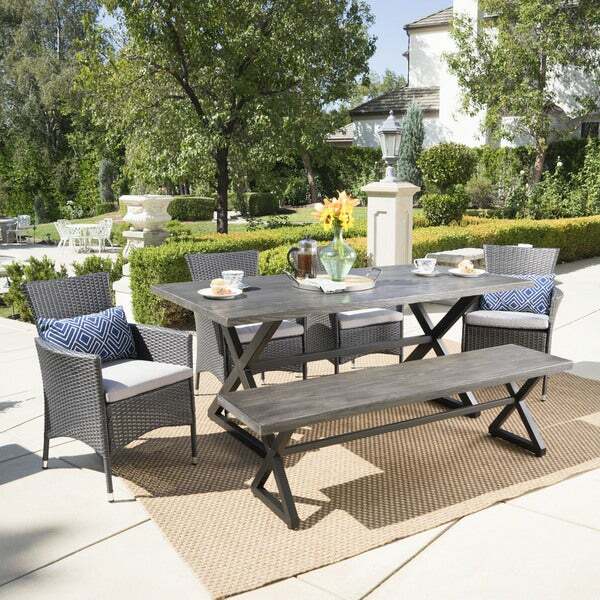 This attractive and comfortable outdoor table set gives you many options for seating, providing both bench and chairs. Complete with a table, bench, and 4 chairs, this set does it all. Made from the highest quality materials and crafted to the most exacting standards, this is the perfect addition to your patio, backyard, or garden. I was very happy with the quality of this product. The chairs are nicely made and the finish on the table is attractive. Good price for what you get. I love this set. It is so pretty. It looks nice and it was a good price. I worry the bench will be hot to sit on during the summer but we'll have to remember to lay a towel down. I definitely recommend it though. Will update with a photo soon. Great quality, easily assembly and look. We are so glad to have a outdoor dining space. It was everything I expected, great quality looks beautiful and can't beat the price. I would most definitely recommend overstock to anyone looking to buy home funiture for good prices. Customer service was also great which was a plus for me. They were friendly and helpful when it came to needing assistance. They were also very knowledgeable about the products and able to answer every question. I love it. It is better quality than I was expecting. All the pieces were in great shape and I assembled it by myself in just a few hours. I also bought the lounge chairs that match. Will look nicer once I dress it up a bit. Quality not bad but chairs a pain to put together. Rest was easy. Hoping it holds up for a couple summers. "Can you purchase additional chairs with this set?" Yes, you may purchase additional chairs at a separate cost. "Is the a hole for an umbrella on the table?? If not could you put one in??"